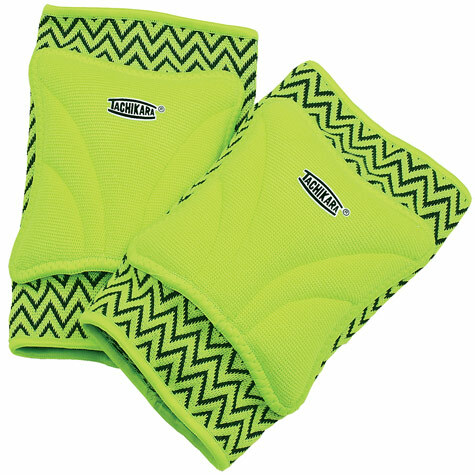 The Tachikara Zig Zag printed Volleyball Kneepad is a fun beginner knee pad and helps protect players from floor contact. These kneepads are thin and comfortable, and provide protection with a cotton sleeve with segmented foam which has added rubber cushioning for more support. Tachikara zig zag print kneepads are intended for recreational use. 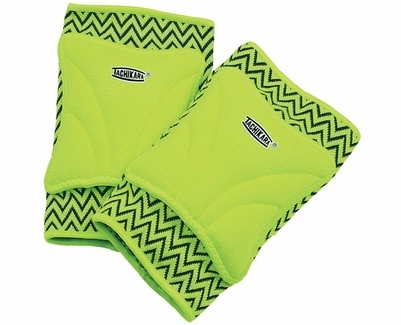 Green Zig Zag Kneepad Material: 74% Polyester, 17% Elastic, 9% Rayon. Sizes: Small / Medium, or Large / XLarge . . . Color: Lime Green with Black Zig Zag . . . Sold as a Pair.